Let’s talk about Eddie Redmayne for a minute. OSCAR. Okay, as you were. I am fascinated by the people who know brand new things before the world gets to know them – the people who look at a quickly drawn tumble of numbers on a blackboard, soft bits of chalk getting in between their fingernails, after weeks and months and years of walking through life and imagining — What if??? The people who suddenly understand the motion of the stars or the energy of an atom. The first man who imagined a way of taking Jules Verne’s wild ideas about space guns and transforming them into one of the grandest moments of human history. One small step for man… The man who takes standard economic theory and turns it on its head. The genius who imagines a wax cylinder of sound — our very own voices preserved for the future. A train, coming to crush a theater — and the moment it stays on screen. The dawn of a new branch of science or mathematics… We’ll call it a quark. Can I just sit next to someone in this moment of discovery, please??? There is something so perfectly, intensely creative about these future moments — when the way things are always going to be somehow bleeds ever so briefly into now, and we whisper the words “This is where it all begins.” This is the day we first hear of the things that will one day become commonplace and accepted, understood by even the youngest around us. We are changed forever, and our history will begin a new orbit after a moment like this. This way of life, this constant exploration is THE THING that gives humanity our life and breath… we explore because we do not understand, because we are seeking that something that will explain everything to us… and perhaps we will never ever arrive at such an extravagant moment of – I understand. Completely — any more than we might ever arrive at such a moment of being known completely by another human being. Even someone as brilliant as Stephen Hawking has thought and rethought his theories. And so we continue on. But we catch glimpses of those moments – brief hints filled with promise and hope. I’ve said it over and over and over… mostly as a joke — but seriously, if someone can figure out how to do this, could you let me know? I wish I had more hours in my day!!! The days and weeks and years will go on regardless of whether we are hopeful or hopeless, whether we are patient or impatient, whether I write or do not write. And on one level, that feels completely suffocating — time will go on whether we want it to or not. But at the same time, I think there can be great freedom in that — October and November and December are going to come, 2015 and beyond will come — and maybe I’ll be really glad that I wrote that one page all those months ago, because TODAY, it matters. And I guess today that it did matter.. and I hope that somehow, in some weird way, that this is encouraging for you as well… time marches on, but what you’re doing MATTERS. I wrote this after Comic Con 2012, and it only seemed fitting to bring it back for today. Enjoy!!! First time at Comic Con? I can help! Comic Con 2012 was a smashing success! There are things no one tells you about Comic Con, because it’s kind of like asking about details of Disneyland. No one tells you about how long they stood in line or how much time they spent staring at the map when they should have been sprinting to make it to yet another showing of Abraham Lincoln. Because who wants to hear that when you can talk about Space Mountain and pizza in Tomorrowland or Indiana Jones and your third Dole Pineapple Whip of the day? (Just me? Where was I? Back to Comic Con…) So I’m going to try to help you out here. 1. You are going to stand in line. For a LONG time. It’s worth it. This morning, Luke and I (and friends) stood 4000+ people back in line for Hall H – home of fantastic panels like FRINGE… and most importantly… DOCTOR WHO! There were people who camped out overnight. Our 3+ hours in line = a cakewalk. It’s just par for the course if you really want to see specific panels or exhibitions or film clips or you just want to stare at Matt Smith see your geek favorites. Get used to the lines. Love the lines. It’s worth it. Seriously, though. You’re standing next to people who love exactly the same tv show/movie/comic book that you do. Make a new friend! Bring a backpack and snacks to share. You’ll totally be the cool kid in the lunchroom whose mom packed the good desserts while everyone else is stuck with squishy day-old turkey. 2. Accept that you won’t get to see everything you wanted to see. It makes you love the things you do get to see. This is coming from the girl who couldn’t make it to the Firefly panel. It just happens sometimes, and that’s okay. Plan as best you can, and just run with it. Make better plans for next year. And take tons of pictures in the panels you do get into. Enjoy it! 3. Sit in on random panels. You might be in for a surprise or two! Now, stopping for another moment of truth. Sometimes, in order to get into a later panel in the day, it means you have to sit through the three panels beforehand. (They don’t clear the room in between panels at Comic Con. Once you’re in the room, you’re in.) Yesterday, while waiting for the Alphas panel in the shiny and beautiful Indigo Ballroom, the moderator got up and announced the TV Guide panel. Thrilling stuff. But there was no way on earth I was missing Alphas, so TV Guide it was. (Is there even a TV Guide anymore? Does anyone still watch that channel?) And then Joel McHale of Community and The Soup walked in. 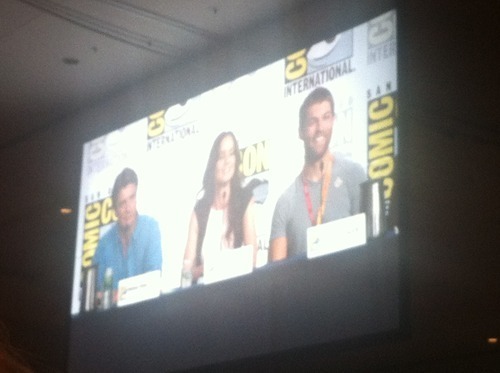 And Liam McIntyre from Spartacus. And Maggie Q from Nikita. And Sarah Wayne Callies from The Walking Dead. And Jasika Nicole from Fringe. And did I mention Matt Smith and Nathan Fillion? It was a fantastic panel and I am SO glad that I just happened to be there. 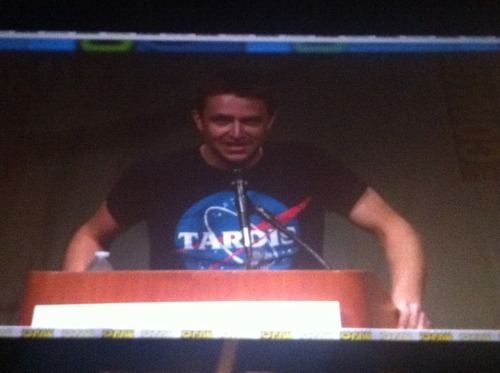 And today, I was in Hall H for the Fringe panel at 10am. And I have been waiting for a year to get into the Doctor Who panel at 12:30 since I couldn’t make it last year (again, see #2). 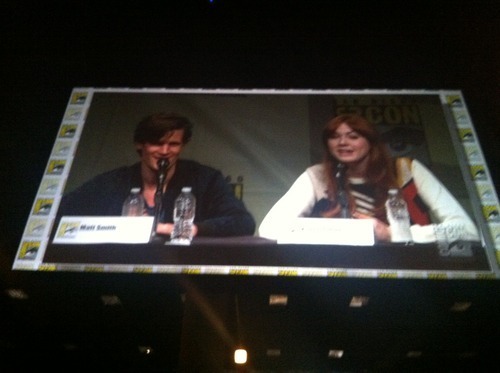 I wouldn’t have missed either of those panels for the world. 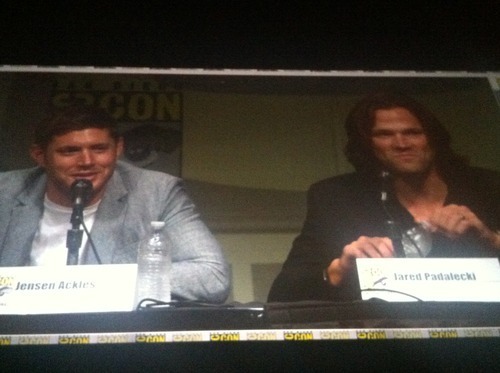 But, in between was the Supernatural panel, a show I just haven’t had a chance to watch. But after today’s panel, I’m seriously going to get Season 1 and start watching. The panel was hilarious, and it made me want to give the show a try. I’m so excited for it! 4. “Cosplay” = all the awesome costumes around you. That’s like Comic Con 101. If you have to ask someone what ‘cosplay’ means, you’ll definitely get the “Who are you and why are you at Comic Con?” look. So now you know. You’re welcome. 5. Doctor Who. TARDIS. Felicia Day. The Guild. Firefly. Star Trek. Tribbles. Star Wars. Buffy. JJ Abrams. Jane Espenson. Battlestar Galactica. Geek and Sundry. Summer Glau. The angels have the phonebox. Chris Hardwick. The Nerdist. Lord of the Rings. As seems to be the theme of this blog, you never know what you’re going to discover. 6. Be ridiculous. Wear the hat. Paint your face. Let your geek flag fly. Have fun!